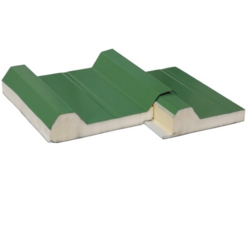 Our product range includes a wide range of sandwich panels. Sandwich Panels offered come in precision design and fabricated finish and provide for easy installation as well as lasting durability. Some of its features include provide for high savings on energy front, light weight and fireproof finish, allows for convenient construction support, suitable for exterior wall renovation where it can be directly fixed on walls, support of rigid polyurethane foam and reflective film for optimum performance, choice of different texture styles, provides for enhanced look to the building facade among others. Sandwich Panels offered are available in light weight construction finish and provide for superior insulation support against heat and sound. Available in easy construction support as well as proving to be economical in usage, these panels assure of elegant appearance and can be offered in different color choices to pick from. Some of its features include provides for high-efficiency usage, suitable for use in public buildings, provide for optimum thermal protection, waterproof finish, use of new multi-purpose construction material for quality solutions among others. Sandwich Panels offered features quality construction finish and provides for complete usage and installation convenience a demanded by the customers. Allowing better insulation from heat, these panels also come with advantages like waterproof finish, fire resistance and moisture resistance. Some of its features include superior sound insulation support, can be used in wide range of applications, high strength & heatproof construction, anti oxidation finish, provided in pre painted galvanized finish, choice of different colors, choice of different insulation support like PU, Rock wool, EPS; suitability for use in areas like hospitals, commercial and industrial facilities, gymnasium, warehouse and others.